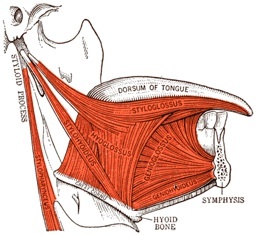 Some of the muscles of the tongue, viewed from the right side. From Kimber et al. Textbook of Anatomy and Physiology, MacMillan, 1893. The tongue is a muscular organ that exhibits complex spatio-temporal gymnastics vital for performing crucial functions such as tasting, chewing, swallowing, and speaking. Ultrasound imaging research has made great strides to capture such intricate and highly coordinated nature of articulatory movements. To understand how the tongue functions in normal and to diagnose and treat pathological conditions, it is important to capture and analyze the tongue motion. A crucial step is the segmentation (contouring or delineations) of the tongue boundary. As ultrasound imaging captures spatio-temporal sequences (videos) of tongue motion, it is important to track the tongue motion with time. TongueTrack is a specialized software for tracking the tongue motion in ultrasound sequences. It has been validated on over 60 sequences (some of which are over 500 frames in length) and achieved an accuracy of about 3mm.